Home / Articles / Why it makes sense to spread your debt. These days whilst spending extended time “on hold” when calling the bank might be inconvenient and annoying, there is a more insidious potential consequence of having everything with the one lender. Let’s say that Dr A. has a home mortgage with BANK 1 which he has had for many years. He also has an investment property loan, a practice property loan and a car loan all with BANK 1. In his practice he has a new business partner, Dr B. Dr B’s home loan is with BANK 2. Dr A and Dr B have taken and guaranteed equipment & fit-out loans, overdraft and business credit cards, again all with BANK 1. These have been taken as “Joint and Several” loans. BANK 1 now has a huge amount of control over the practice, which neither Doctor fully realises. As Dr A represents a large dollar exposure to BANK 1, he is subjected to annual Bank reviews of ALL of his facilities. One day something happens out of the blue, which puts pressure on the practice’s perceived ability to make payments on the equipment and fit-out loans. Bank 1 starts to get nervous, given the large dollar exposure and starts asking for reductions of overdraft balance and limit. 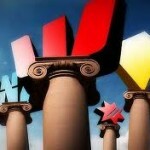 This puts more pressure on valuable cash flow and the Bank starts eyeing off assets for possible repossession and sale. Dr A has the view that each asset loan is separate and non payment would result in the repossession and sale of THAT asset. He also has the view that Dr B is 50% responsible for the joint loans. BANK 1 has a view that ALL LOANS are SECURED BY ALL SECURITY and as they hold Dr A’s HOME LOAN and other property they can repossess HIS real etatereal estate. An important note here is that as “Joint and Several” debts the bank can choose who to pursue and to what extent. reposes assets and have a “fire sale auction”. So what could the Dr’s have done differently? At any stage in their borrowing life they could have spoken to a skilled, specialist finance broker, who would have spread the different debt facilities across a range of lenders. Both clients and the business still use a main bank, but the key is to use the bank for what they are good at and within very concise boundaries. Specifically they should not have taken business lending with the same bank that held the directors’ home loans. Interestingly in this case DR A unwittingly gave Dr B a free ride security-wise. Spreading the debt also gives a number of banks a smaller dollar exposure and the annual reviews are much reduced. At Healthcare Financial Strategies we treasure the LIFETIME VALUE of every client and hope to write many loans for each of them in the future. Each new piece of equipment, investment property, speedboat, motor vehicle loan can be considered across many banks at the time of purchase. Importantly no one bank has too much control over the business. In short it’s a strategy of having a finance advocate to keep the banks hungry, keep them keen and most importantly keep them honest. Remembering the winning bank pays the broker for the introduction. The business owner usually doesn’t pay the broker a fee. So what was the event out of the blue? There are many more. Obviously some events can be insured against but some can’t. Healthcare Financial Strategies strives to keep our clients successful, prosperous and borrowing and we will provide valuable input to keep clients on track and in control.